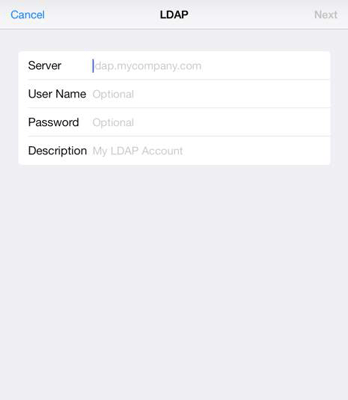 You can set up a Lightweight Directory Access Protocol (LDAP) account on your iPad to access an enterprise network. LDAP accounts allow you to search for contacts on an LDAP server, which many organizations use to store data, and access them through iPad Contacts. If you work at a company that uses Microsoft Exchange and you are an avid iPad user, this is very good news. In Settings, tap Mail, Contacts, Calendars. Enter your LDAP account information and then tap Next to verify the account. Congratulations! You are all set up and ready to go. When you’ve set up this type of account, contacts imported from the account appear as a group in the iPad Contacts app as with any group. To see these contacts, your iPad has to be connected to the Internet because they aren’t stored locally (meaning that they’re stored on your company’s servers). If necessary, check with your company’s network administrator for information about your network and LDAP requirements.